I am looking for a way to control the opacity of lightening and darkening effect of blending a layer separately. Such as 10% opacity for darkening and 65% opacity for lightening. - duplication of the layer and have the two layers blend with different blend modes. The problem is that the top layer would then be applied on the result of blending the lower layer, changing the final result. Another problem is that changes to one instance of the layer would need to be manually propagated to the duplicate. - blending based on the absolute luminosity of the current layer, or absolute luminosity of the lower layer. It is their relative luminosity which is important instead. One of the things this would enable is selective control of the opacity of the dark and light halos you get with Unsharp mask live filter. I'm not 100% sure but that might do it. It is also possible to attach (nest) a curves layer and set it to Alpha (transparent). You can use the curves to adjust. I hope one of those helps. 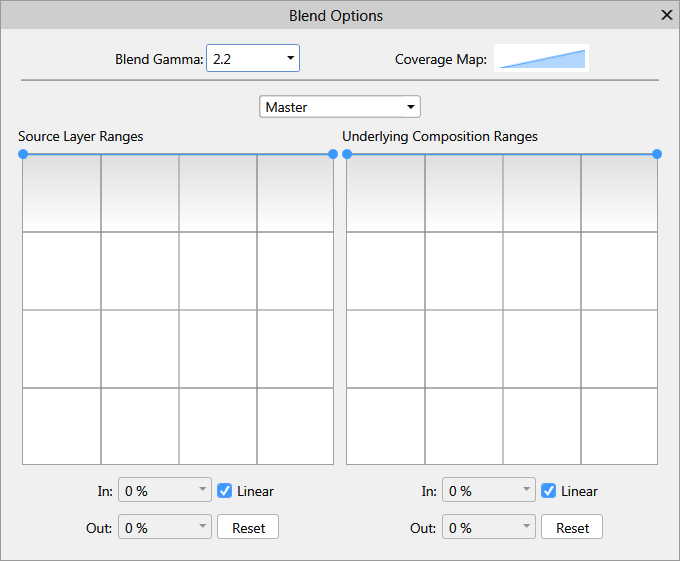 Layer blend ranges only take into account the absolute values of current layer or underlying layer. I don't want to make it transparent where it is dark, but where it is darker than the underlying.